Looking for a USED MV4800 ADVANCE? MV4800 is now capable of submerged cutting up to 20.0 inches deep with full support of the best auto-threading system on the market today. With an annealing length of over 27 inches, this system is capable of threading the maximum workpiece height both at the start point and through the gap if needed for a broken wire recovery. The MV4800 features a new, non-contact cylindrical drive system and the M700 series control with a 15-inch touchscreen. With advancements in machine construction and power supply technology, the MV4800 is sure to revolutionize EDM machining and increase your shop's productivity. 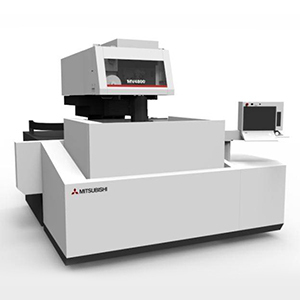 Looking to Purchase a New MITSUBISHI EDM MV4800 ADVANCE?